I'm not sure exactly what I was expecting when I first started reading this book, but I know for a fact that what I did get was so much better than I had hoped for. In my experience, sequels are almost never a sure thing. Sometimes they go so much above and beyond your expectations that you feel like you can fly, and sometimes they're such a disappointment that you just want to sit in a corner and cry. This book was somewhere in the middle, but there wasn't a single moment where I was bored or wanted to put the book down (which is surprising considering my romance-addled mind and the relatively small quantity of scenes Sorin was in). For any Sorin-Ileni shippers, don't worry about them being separated. In fact, the first chapter is actually a conversation between the two, so don't be afraid to pick up the book on that account. That being said, Sorin isn't a major character in this novel, and there are only a few chapters with him actually in it. The funny thing is, I didn't really mind it. Death Marked is all about Ileni's journey to figure out whether or not it was right to side with the assassins, and let me just say it's a pretty interesting story. What I loved about her in this novel was that no matter how much Sorin or anyone else pushed her to make a choice, Ileni stood by her beliefs, and refused to choose a side until she believed it was the right one. Ileni suffered through a lot of character development in this book, and that in itself was one of the best parts of the book. Instead of being hung up over the assassin leader she loves, but would betray her if he had to, she focuses instead on something much more important: imminent war and the death of innocents (we finally have a heroine with her head on (mostly) straight). Ileni's new streak of independence and justice was an amazing thing to see, and besides, it's not like there wasn't any eye candy...*cough* Erin *cough*. Readers meet many new characters, as well as some of the old ones, and every character has a part to play in the intricate plot that the author, Leah Cypess, has created in this book. There are no clear-cut good guys and bad guys, which only makes it that much harder for Ileni to come to a decision. The reader is put in the same exact position Ileni is, yet is stuck in the same predicament as Ileni - which is the better side? Ileni's character was made more real in this sequel through the emphasis on her faults. I'm not sure if she had as many faults in the last book - she probably did - but her attraction to magic, despite the truth of where her borrowed magic came from, only made her that much more real of a character. Unlike many characters in books who preach noble ideals and live by them (though don't get me wrong, I love them too), Ileni's inability to follow her Renegai ideals made her that much more interesting a character, and allows the reader to empathize with her. Yes, it also made her a hypocrite sometimes, but then again, aren't we all? My favorite character in the book is definitely Erin. Well, either him or his little brother Girad, who is so adorable I can't even. But let's stick with Erin for now. Erin sort of plays the love interest in Death Marked, but just barely. Now, before you start swearing off this book forever - or wanting to read it that much faster - Erin isn't normal love triangle material. He's a great character with a lot of hidden depth and emotions he doesn't let other people see, but at the same time, he's not Sorin (though that's probably a good thing, considering Sorin wouldn't hesitate to kill a child - his words, not mine). Erin is downright the best guy in the novel, and yet Ileni sort of only has eyes for one person. Until a certain incident. At which point she's really confused, but not confused in the way you think she is. Until she is. Kind of. If that didn't make sense to you, just know that it's not your typical love triangle, or really a long triangle at all, really. There's just a very interesting dynamic between Ileni and Erin, and that dynamic doesn't have to be romance. Unless they want it to. This particular book defied all my expectations and was so much better than I had ever dared wish. If you know me, you probably also know that it takes me a millennia just to pick up the sequel of a book. I'm usually so terrified of being underwhelmed that I never really get the courage to finish the series. 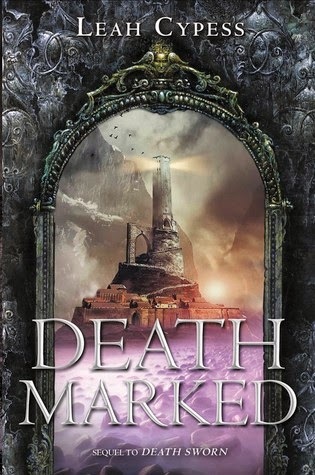 Death Marked, however, is literally the perfect second book to Death Sworn. It has the same feel and pace to it, and the plot is just as engaging. The combination of new, absorbing characters, as well as a Sorin who is so in the shadows you don't know whether to root for him or run away, make this book something you definitely want to add to your TBR if you haven't already. Oh, and that ending is killer; you really want this book. Book Synopsis: A young sorceress’s entire life has been shaped to destroy the empire controlling her world. But if everything she knows is a lie, will she even want to fulfill her destiny? The sequel to Death Sworn is just as full of magic and surprising revelations, and will thrill fans of Leigh Bardugo and Robin LaFevers. Source: A copy was received from the publisher for review. Thank you!